You won the monogrammed burlap tree skirt!!! Shoot me an email, Molly!!! Friday was FREEZING And I wore it with a mustard sweater, military jacket AND puffer vest. Oh, and furry boots to boot. and I put it on with my leggings and a big cardi to take Griffin to Presley's party on Sunday. And then I wore it again yesterday with a cream sweater, brown cords, military jacket and TOMS flats. After posting several pics of my scarf on IG, people pretty much DEMANDED a tutorial on how I wear it without it feeling like it was eating my face :) I attempted a photo tutorial, but I couldn't convey what I wanted to say sooooooooooooo I bit the bullet and made a tutorial video. EEEP! They're big and chunky and SUPER good quality. 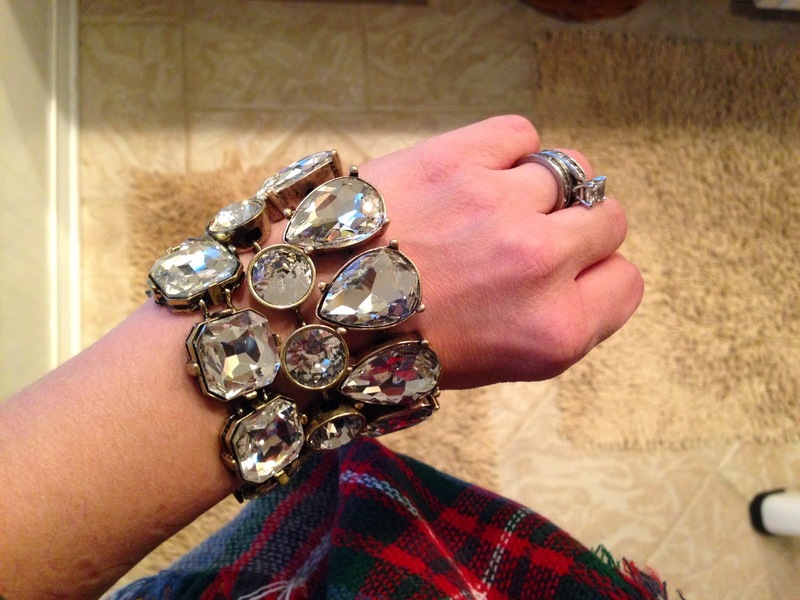 They sparkle like crazy and are fun to stack or mix in with other bracelets. They would make really fun Christmas presents for some of the ladies on your list as well! Don't have a FABULOUS scarf to practice on??? No worries! Enter below to win won for yourself! Thank you and shout out to TaraLynns for providing me with the scarf to give away. I purchased my scarf and loved it so much I wanted to share it with the world. hahaha Also, this post contains affiliate links, which just means that if you click on a link and purchase what I've linked to, I'll receive a commission. Thank you for reading and fot supporting my blog! Love y'all! You are so cute, Andrea. :) I wanna be like you when I grow up. :) Hope GG is feeling better!! I love it!! Your too cute...Love reading your blog!! I love love your blanket scarf!!!! I don't even wear scarves but I still watched the video because you are too cute!!! Love a big scarf! It's freezing in MN. I am so excited about this post!! I have two blanket scarves that are laying in the closet, and I have had no clue how to wear them!! I'm breaking one out today! ;) thanks for sharing! Thank you Andrea!!! How sweet are you?!? I have a summery scarf from Old Navy that I wear kind of like that. :) Haven't got a wintery blanket scarf yet. I loved every bit of your tutorial. And I have to say, I think the wave was my favorite part! Good stuff. Greta tutorial! And, I love the different ways you styled that scarf! So fun!! Such a a fabulous scarf! And you are too cute in your tutorial!! You are super cute. :) Thanks so much for going out of your comfort zone and doing this! I have this exact scarf and I'm constantly feeling swallowed up by it. This is perfect! I found a smaller blanket scarf at Old Navy this weekend but was scared to try to attempt to wear it. Now I know how! Thanks so much for the post! Great video!! Would love a blanket scarf! thanks for the video. It was very helpful. I had no idea how to wear a blanket scarf. Love the scarf and the wave! I laughed at your "suffocating" comment. Exactly how I've felt before. Will give your tutorial a try. Love, love, love! Thanks for the chance! You are too cute sister! Thank you for this. Going to attempt...ha, ha.....and you are just the cutest thing....really, you should do video tutorials more often.....you were real, personable and down to earth......thanks for the info!!!! Thank you for that tutorial!! ....and I always have a basket full of laundry somewhere too! Thanks for the scarf tutorial - it looks so great! I wanna win! I need that blanket scarf, stat! Loved the tutorial and you are just darlin! :) I need this scarf in my life!! Awww, so cute. Your video just made me smile! Thanks for the great info!!! So fun! Love both scarves you pictured! You are just the cutest. Love both scarves you have. You know what I loved the most? Getting to hear your voice! It is always nice to be able to connect the fave and the voice, now it really feels like I know you! Love the scarf you showed! Yay for giveaway! I have loved scarfs long before there was a bandwagon. Wore the tiny scarfs tied around neck when I worked at Harold Powell (RIP) ca 1998 and been wearing them ever since!! Thanks for the tutorial...I love the way those big scarves look on others, but could never figure out how to NOT look like I'm drowning in one! You are just too cute! Loved your video! OMG! After watching that video and seeing your comments on it I think we should be BFF's. Even if it is totally one sided (mine) it is happening! haha! Such "good stuff!!" Thank you so much for this tutorial and I love the scarf!! Cutest thing ever! The wave pic has me making the crying laughing emoti face!! The tutorial was adorable and perfect - thank you!!! Love the big warm scarves, fun giveaway!! Loving that first scarf! Up here in Maryland we are always in desperate need of more layers. It is so funny to finally hear your voice. It is just like I thought it would be, caring, and very sweet. Love your blog, and the pics of your mini, as you know make my day! You're too cute! Thanks for teaching us!! I have a love/hate relationship with scarves, but when I love, I LOVE. Lots of color, lots of volume, lots of patter, lots of everything. More is more. Great job! The scarves are so cute! I had no idea that scarf was so big until you unwrapped it! It looks very warm and cozy! You look adorable! Scarf is darling! The video only made me adore you more. Awkward wave right back at ya, sister! Thanks so much for sharing! Very helpful! You are too stinkin adorable...love the video! Wondering if you could tie the ends together right away and then wrap it around like an infinity scarf?! That seems like it could work too! I was for sure on the fence about a blanket scarf but you may have convinced me that it won't eat my face, ha! Scarf is soooo cute! Love the plaid! so bummed the tan is sold out! it is gorgeous! Will need to stalk! Love the scarf! Love your wave at the end. #1 - I totally shared your video because my girlies need to learn to tie like you :) #2 - I loved your wave! Though we have never met, I just believe you are a sweet person! Thanks for teaching us! I am excited to see Tara's stuff! Ooh I could use a blanket scarf at work! Thanks for the tutorial, I used to find them intimidating to wear but you make it look so easy!! Thanks!! You are so cute! I think you rocked your tutorial video- I know it's so awkward to video yourself- but you did great!! I love reading your blog and would love the blanket scarf. Thanks for a fun giveaway! That was the best tutorial I've ever seen...short, sweet, and fun! Thank you for helping me make sure my blanket scarf doesn't eat my face off haha. Love the scarves!!! Thanks for the tutorial! Perfect timing...I've been pinning tutorials on how to tie scarves! Thanks for this one! I love blanket scarfs!! Thanks for the tutorial!! I wore mine yesterday because I just couldn't wait until today for your tutorial...and now I'm kicking myself because my scarf was definitely "eating my face". Should have waited for your video! love the scarf and tutorial, thanks for posting. Just saw a blanket scarf recently at a store and because i could not figure out how to wrap it i did not purchase it and it was at a great price ugggg! Omg I die - your tutorial is awesome. When I got my plaid one in the mail, I messed with it for some time until I found the perfect way to wear it. Totally want more blanket scarves in my life. I'm in love with scarves this year! Awesome tutorial! I totally needed one of these scarves dropping off my kiddos at PS this morning! Andrea, I love your blog. You always make me laugh!! BTW, love the scarves, also. I would love to give one of these a try. Your video was cute and I think you did a great job explaining what to do! Yep. I totally wish I lived in McKinney so I could be your friend. Ha! I just bought a big ol' scarf so thanks for showing how it's done! You're cute as ever! LOVE this scarf! on my way to snag one (: thank you! Your video was awesome! Thanks for the tutorial. I currently do not own a blanket scarf and it would be awesome to have in my collection. Thank you for the tutorial! I needed it! Ps you are so adorable! I always feel claustrophobic in scarves. I'll have to try this tying method. Thanks! I love the black/white one because it looks houndstooth to me! Roll Tide! I love your blog and you seriously seem SO nice! I have that same scarf and love it but would love the black and white one too. Thanks for the giveaway. Your style is so cute! I would love one of these blanket scarves! I just found your blog and it's so dang cute! Crossing my fingers for this because I have been DYING for a blanket scarf!!! Love your blog and the scarf!! Hope you're having a nice day! Love your blog and style!! It was a great tutorial!! Love the wave and the tutorial! Thanks for the tutorial! You are always so cute! I love anything buffalo plaid! That red and black scarf is so cute! Such a fun video! Thanks! Thank you for the tutorial. I also loved seeing the pics of all the outfits you wore with the scarf! Your blog is great! I love ALL kinds of scarfs, especially this one! You are the cutest!! And did I hear you say shameless plug? ;) haha too funny! Love the scarf and the awkward wave haha!! You sound so much like Auntie Joyce, it's crazy! Thank you for the tutorial. I have always wondered how to tye them. Love the video! Thanks for the help! Thanks! I have one and always feel like it's attacking me when I wear it!! You are too cute in your video! Thanks or the tutorial--and the wave is sweet! That was adorable!! Brings back memories of my awful Ice Bucket Challenge video! From Vancouver, Canada I LOVE your blog! You are so real and down to earth. Thanks for the tutorial! Love that scarf!! Love it, on my Christmas list! Love reading your blog and you always look so cute!! Thanks for the adorable tutorial! Love your blog! I need a scarf like that....stat!! Love it! I guess I need to add a blanket scarf to my Christmas List! I love it! Thanks for the tutorial! I must have a blanket scarf! Such a cute scarf! Your tutorial was so adorable! Pretty sure I didn't know blanket scarves were a thing and I couldn't figure out why my scarves were never as big and puffy as everyone else's!!! Thank you for opening my eyes...now I have to go because I have a date with my debit card. Love the plaid blanket scarf! Great video and that scarf goes with everything! I'm excited to learn to tie this type of scarf! Thanks for the video! Thanks for the tutorial! I need a blanket scarf now! You were adorable in the video! I would love a blanket scarf! Lovd your blog and sense of style!!! You are so cute, so glad your sweet girl is feeling better. Great tutorial. Love the scarf! Oh...my....goodness....I thought you were adorable before but after hearing your sweet spunky voice I totally get why so many people adore you!! Cute cute! You teache well...no wonder your students love you! You are super cute. It wasn't awkward at all! Love your blog and loved hearing your voice. It's freezing down in Austin too! Thanks for the tutorial! I ordered one of these scarfs a few weeks ago. That was the cutest video! Now I need a blanket scarf! Love love this scarf, and your video is just adorable. You would be fab on tv! Obsessed with blanket scarves--love that this one is plaid!! Love, Love, Love this scarf!!!!!!!!! Love it. I wear scarves all.year.long. You're too cute! Love the blanket scarf...have to get me one!